If you are concerned about a child being at risk of FGM please contact Harrow MASH or the police if the child is felt to be at immediate risk of harm. The National FGM Centre is working in Harrow and should be notified of any concerns relating to FGM. 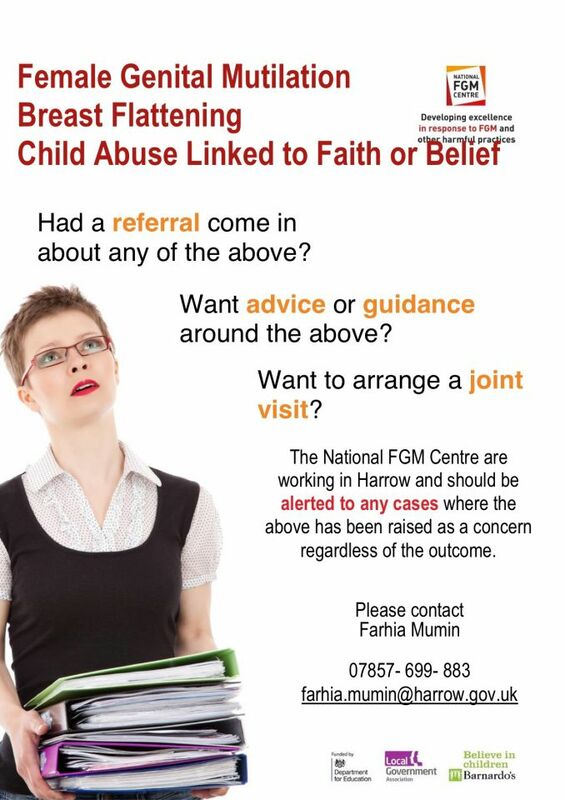 Contact Farhia Mumin at farhia.mumin@harrow.gov.uk or call 07857699883 or 0208 424 1639 ext 2639. The FGM Centre are providing training in Harrow on FGM and Breast Flattening, for booking and further details see here. The Department of Health has published a set of films about female genital mutilation (FGM) for healthcare professionals. Topics covered include: the impact of FGM on mental health; mandatory reporting; personal experiences of FGM and how healthcare professionals can support victims. This new App has been created to help protect young girls and women from female genital mutilation (FGM). It includes: information about FGM; personal stories from those who have been affected; links to educational films; a quiz; and tips on how to get involved in campaigning to end the practice. it provides details of where those affected or at risk can go to get help and advice and provides access the NSPCC’s National FGM Helpline at the touch of a button. It works across most mobile devices. The school had six months of regular meetings with stakeholders including health services, children’s services, their parent group, the voluntary sector, the police, cluster schools and charities to understand the facts, the various educational approaches, training and engagement with communities. Following these meetings the school created their own FGM lesson plans, resources and approaches which they were shared with their stakeholders and modified as required. All Year 5 & 6 pupils’ parents met the school and reviewed the resources before the lessons were piloted and INSETs were held for their staff, governors and parents.